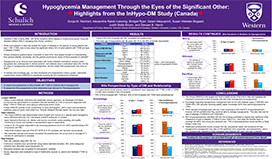 Real-world crude incidence of hypoglycemia in adults with diabetes: Results of the InHypo-DM Study, Canada. 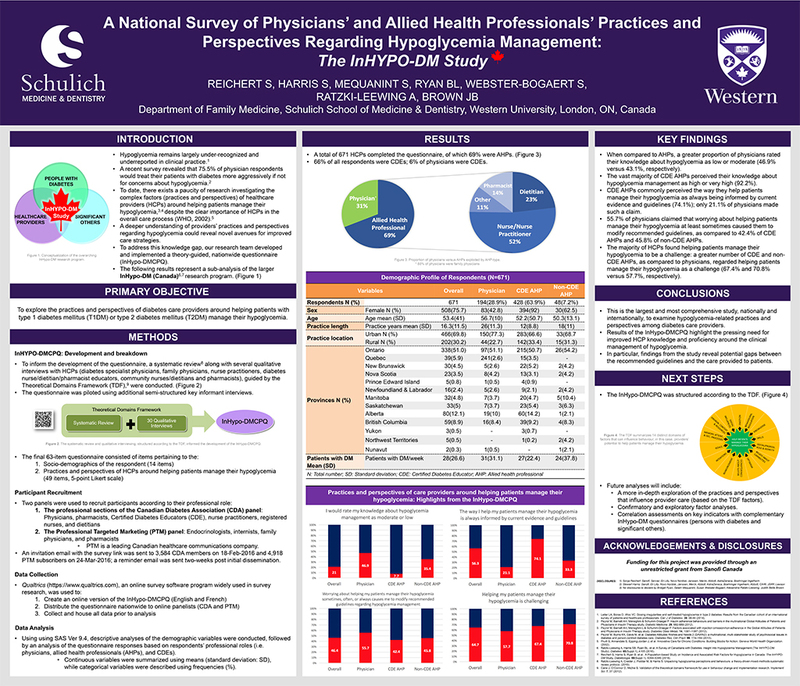 A qualitative enquiry of hypoglycemia and the social determinants of health: The InHypo-DM study, Canada. Ratzki-Leewing A, Harris S, Mequanint S, Au N, Black JE, Reichert S, Brown JB, Ryan BL. 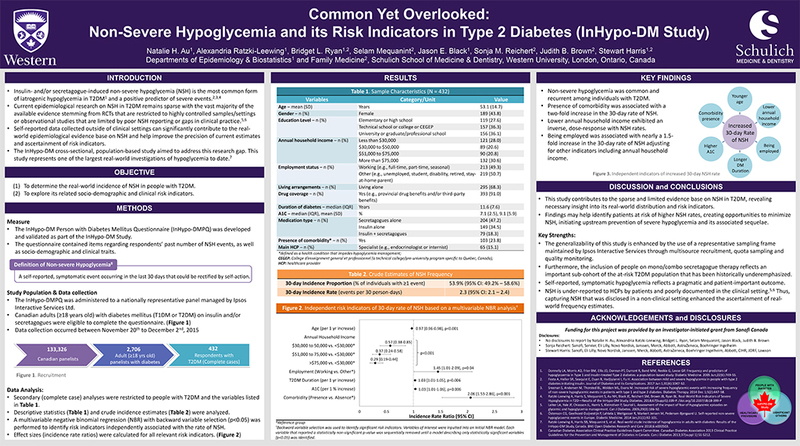 Uncovering the Key Real-world Risk Indicator of Severe Hypoglycemia in T2DM (InHypo-DM Study). The Canadian Journal of Diabetes. 2018; 42(5): S52. Au NH, Ratzki-Leewing A, Ryan BL, Mequanint S, Black JE, Reichert S, Brown JB, Harris S. Raising the Bar on Low Blood Sugar Management: Who’s At-Risk of Non-Severe Hypoglycemia? (InHypo-DM Study). The Canadian Journal of Diabetes. 2018; 42(5): S53. Ratzki-Leewing A, Black JE, Mequanint S, Au NH, Ryan BL, Reichert S, Brown JB, Harris S. The “Unspoken” Truth: Suboptimal Reporting of Severe Hypoglycemia in Diabetes (InHypo-DM Study). The Canadian Journal of Diabetes. 2018; 42(5): S52-53. Au NH, Ratzki-Leewing A, Ryan BL, Mequanint S, Black JE, Reichert S, Brown JB, Harris S. Common yet overlooked: non-severe hypoglycaemia and its risk indicators in type 2 diabetes (InHypo-DM Study). Diabetologia. 2018. 61(Suppl 1): S450. Ratzki-Leewing A, Harris S, Mequanint S, Au N, Black JE, Reichert S, Brown JB, Ryan BL. 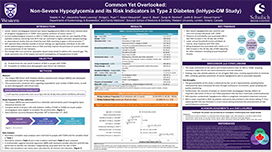 Real-world risk indicators of severe hypoglycemia in T2D: Results of the InHypo-DM Study. Diabetes. 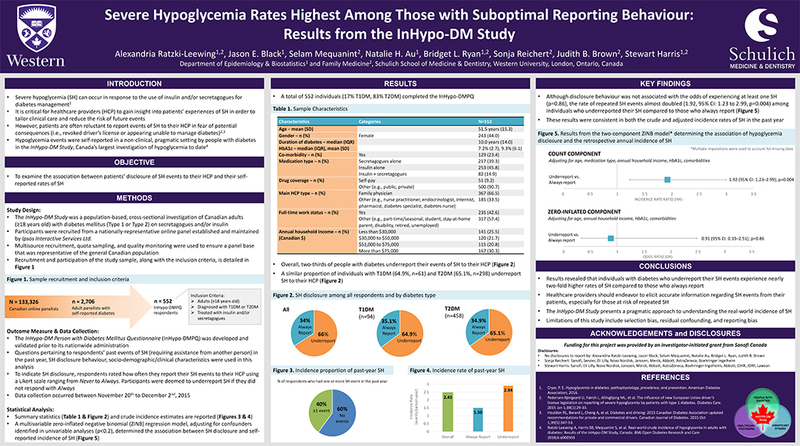 2018; 67(Suppl 1): 377-P.
Ratzki-Leewing A, Black JE, Mequanint S, Au NH, Ryan BL, Reichert S, Brown JB, Harris S. Severe hypoglycemia rates Are highest among those with sub-Optimal reporting behaviour: Results from the InHypo-DM Study. Diabetes. 2018; 67(Suppl 1): 399-P. 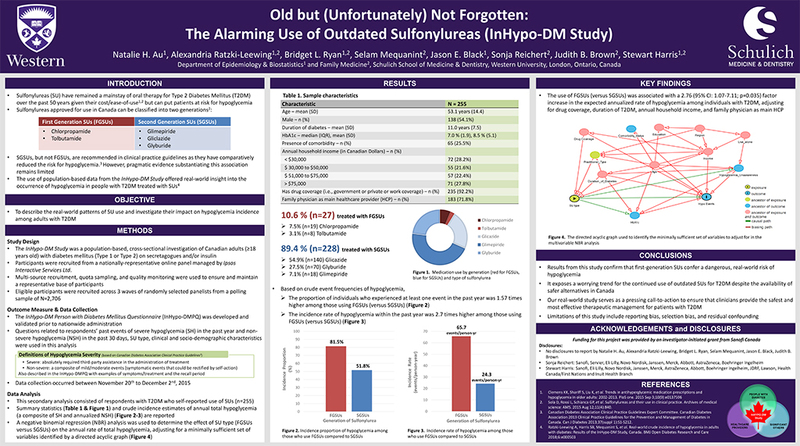 Au NH, Ratzki-Leewing A, Ryan BL, Mequanint S, Black JE, Reichert S, Brown JB, Harris S. Old but (unfortunately) not forgotten: The alarming use of outdated sulfonylureas (InHypo-DM Study). Diabetes. 2018; 67(Suppl 1): 127-LB. Ratzki-Leewing A, Harris S, Ryan BL, Reichert S, Mequanint S, Webster-Bogaert S, and Brown JB. 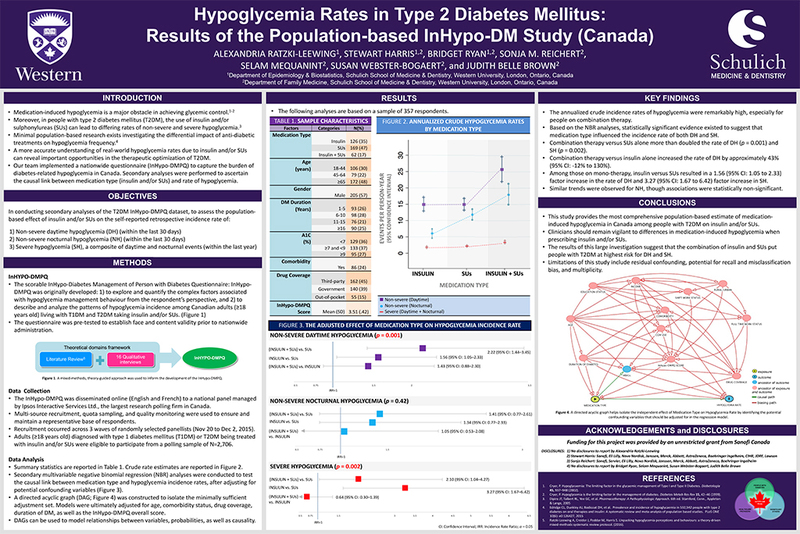 Hypoglycemia rates in type 2 diabetes mellitus differ by medication type (InHypo-DM Canada). The Canadian Journal of Diabetes. 2017; 41(5): S68-S69. Reichert S, Ratzki-Leewing A, Ryan BL, Mequanint S, Webster-Bogaert S, Brown JB, Harris S. Experiences of hypoglycemia management from the significant others’ perspective: Insight from the InHypo-DM Study (Canada). The Canadian Journal of Diabetes. 2017; 41(5): S69. Ratzki-Leewing A, Harris S, Ryan BL, Reichert S, Mequanint S, Webster-Bogaert S, Brown JB. 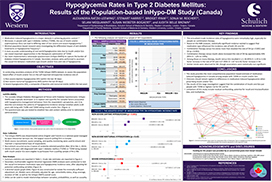 Hypoglycemia rates in type 2 diabetes mellitus: Results of the population-based InHypo-DM Study (Canada). Diabetes. 2017; 66(Suppl 1): A107. 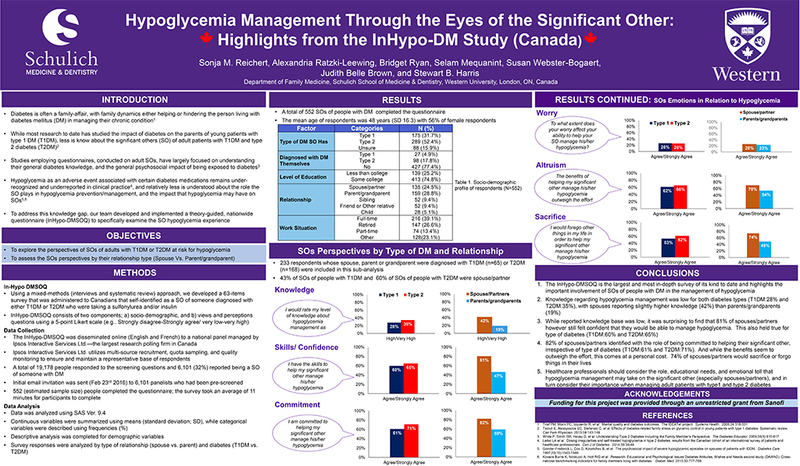 Reichert S, Ratzki-Leewing A, Ryan BL, Mequanint S, Webster-Bogaert S, Brown JB, Harris S. Hypoglycemia management through the eyes of the significant other: Highlights from the InHypo-DM Study (Canada). Diabetes. 2017; 66(Suppl 1):A106. Harris S, Reichert S, Ryan B, Mequanint S, Webster-Bogaert S, Ratzki-Leewing A, Brown J. 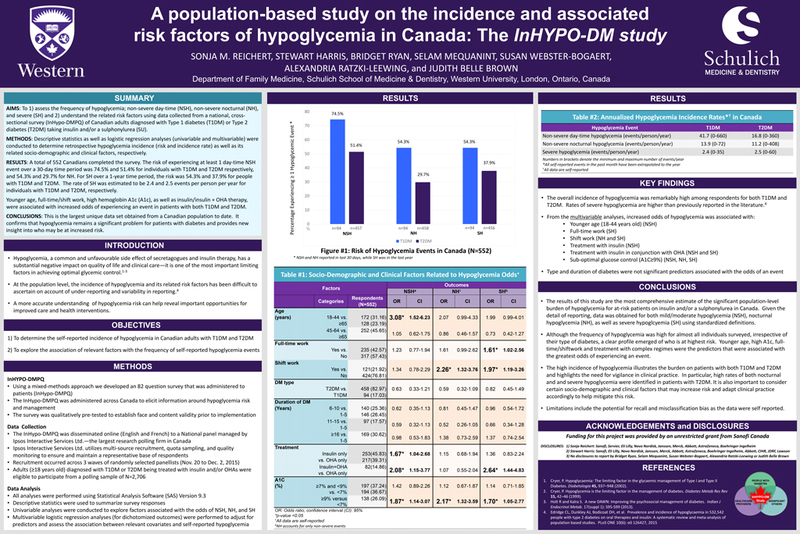 A population-based study on incidence and associated risk factors for hypoglycemia in Canada: The InHYPO-DM Study. The Canadian Journal of Diabetes. 2016; 40(5): S11-12. Reichert S, Harris S, Ryan B, Mequanint S, Webster-Bogaert S, Ratzki-Leewing A, Brown J. 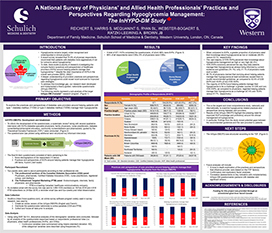 A National Survey of physicians’ and allied health professionals’ practices and perspectives regarding hypoglycemia management: The InHYPO-DM Study. The Canadian Journal of Diabetes. 2016; 40(5): S58-S59. Reichert S, Harris S, Ryan B, Mequanint S, Webster-Bogaert S, Ratzki-Leewing A, Brown JB. 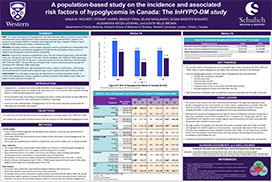 A population-based study on incidence and associated risk factors for hypoglycemia in Canada: the InHypo-DM study. Diabetologia. 2016; 59(Suppl 1): S394-395. 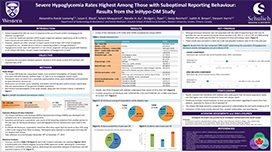 Ratzki-Leewing A, Harris SB, Ryan BL, Reichert S, Webster-Bogaert S. A survey of Canadians with diabetes: Insight into hypoglycemia management (The InHYPO-DM Study). Diabetes. 2016; 65(Suppl 1): A105.